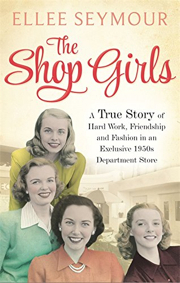 I am counting the weeks now till the publication on 25 September of my book, The Shop Girls. It is a heartfelt and dramatic collection of memoirs of young women who worked in an upmarket Cambridge ladies department store during the 1940s-60s called Heyworth’s which served titled and distinguished ladies related to the royal family, as well as gypsy women from the Midsummer Fair who bought the frilliest and most expensive frocks for their daughters. These lovely women, now in their 80s and 90s, had the most incredible experiences spanning the war years before becoming shop girls. Little did I realise when I started writing this book that I would learn so much more than expected about their extraordinary lives and tender romances, the hardship and poverty during their early years, the fun and camaraderie they shared, and the sadness and personal tragedies that touched their lives. It includes the impact the American GIs had in Cambridge, the shop girls‘ trip to Butlin’s when Des O’Conner was a red coat, and the Swinging 60s scene in the world famous university city with the students’ riotous Rag Week antics, including kidnapping and auctioning off one of the shop girls. And so much more …. The store closed in 1965 and very few people today in Cambridge can remember Heyworth’s, but those who do all say how fabulous it was. Writing this book has been like bringing a ghost back to life. The material I gathered during my research and interviews with over a dozen ladies who worked in this wonderful store was a joy as each time I saw them they recalled more and more incredible stories. Herbert Heyworth, who ran the store, was a larger than life character like Gordon Selfridge, who thought nothing of chartering a plane from Cambridge to visit Paris for the day, taking his shop girls there to see a fashion show. My research into the background of the Heyworth family also uncovered a major shock and family secret that will be revealed in the book. I discovered Cambridge links with Gordon and Rosalie Selfridge, as well as Gordon Junior, which the book will also describe.The hugely successful television series was based on the terrific book, Shopping, Seduction & Mr Selfridge by Lindy Woodhead, and this greatly inspired me while writing The Shop Girls. The photograph shows the shop girls on an annual Heyworth’s outing in 1946. Don’t they look wonderful!